I’m very lucky to do a job that I love. Historically, I have got bored very quickly, but I can honestly say that of the hundreds of gardens I have worked on, there are no two that are essentially the same. There are different climates, different soils, different settings, sizes, existing vegetation and client requirements at play which always keep it fresh. 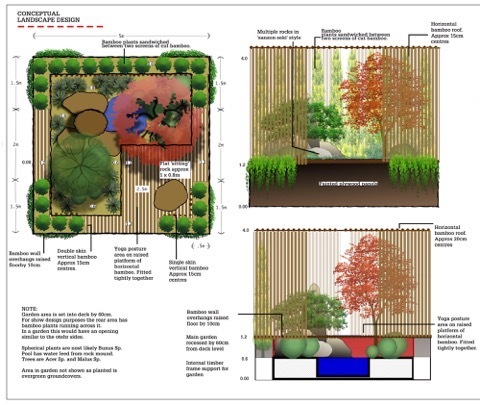 The flip side of the interest provided by this complexity is that you never quite get to create ‘the ultimate’ garden. Even in your own garden, you dream of just lifting up the old gum tree and moving it two metres to the left, of injecting the established Camellia with some potion to tone down the illuminous pink colour, and you wonder, on a daily basis, who was to blame for putting those steps in completely the wrong place. Even more significantly, I challenge you to find a single gardener who doesn’t dream of planting quite unsuitable species for their home conditions. With show gardens, you have a clean sheet of paper. The size is fixed and plant availability can be frustrating, but other than that, Bob’s your uncle (hello Uncle Bob; yes, really, I do have one). Almost any plant will survive five days no matter where you place it. Show gardens really earn their space when they are one step removed from your typical, suburban, professionally-designed garden. They should be there to inspire, to bring fresh ideas, to express the true passion of the designer, to demonstrate real innovation and to set possible new directions in garden design. To fully exploit the blank canvas/no restrictions scenario. 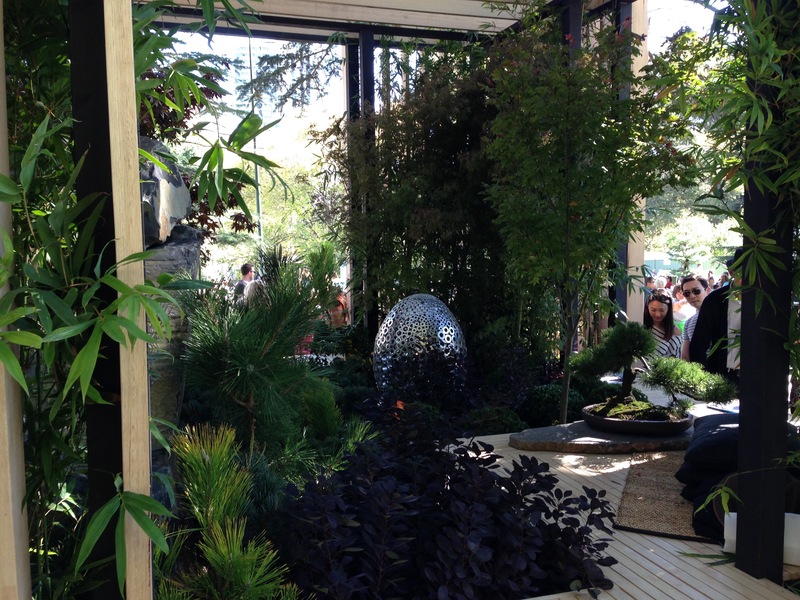 At MIFGS this year, a number of show gardens had elements of this. But in my opinion, only one had it through and through. 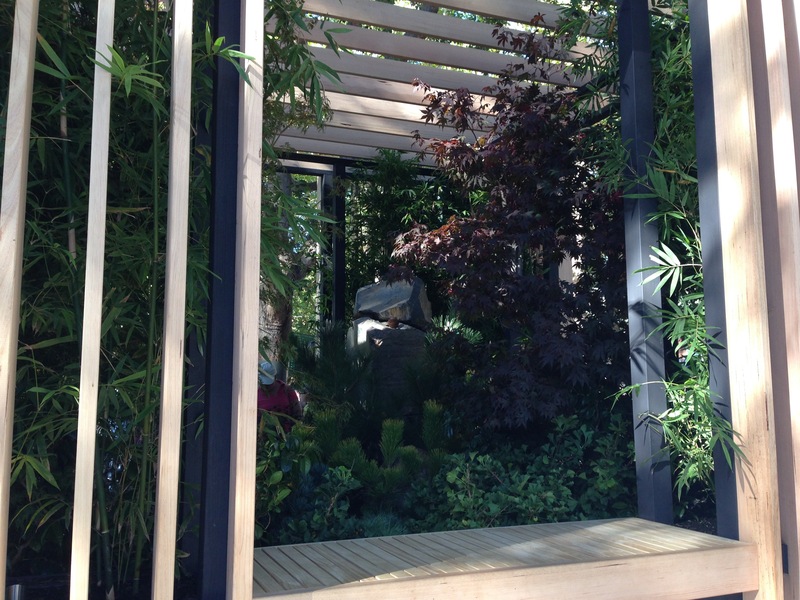 Jai Cheswick’s ‘Urban Temple’; a Boutique (five by five metre) Garden. From the first moment you catch sight of it, you realise it is truly different to anything else at the show, either this year or any other for that matter. It therefore intrigues you and draws you closer, just as great gardens do. You can’t see it all in one glance, just as with other great gardens. When you get there, you see there are four gardens. Each viewed from one of four windows. They all look onto the same small site, but each provides entirely different focal points and planting combinations. There is a quiet place to sit, but all around is full to bursting with plants. Just my type of garden. There are large plants and small plants, vertical plants and horizontal plants, green foliage and burgundy foliage, enclosed spaces and open spaces, light and darkness and stillness and movement. And yet the whole sits in total unity; each element entirely comfortable with its surroundings. In other words, there is contrast without dominance. The whole much greater than the sum of the parts and true depth of interest without a feeling of busyness. These are themes that, as I have been writing my blog and exploring more rigorously what great gardens have in common, I see reoccurring again and again in the very best of them. I spent some time taking in this garden. Only 25 square metres and yet there was so much to see. I walked around each of the windows. I took photos from each. I walked round again (and again). It exuded quite magical vibes. I found myself being drawn back to it each time I went off to explore other gardens. It really was special. 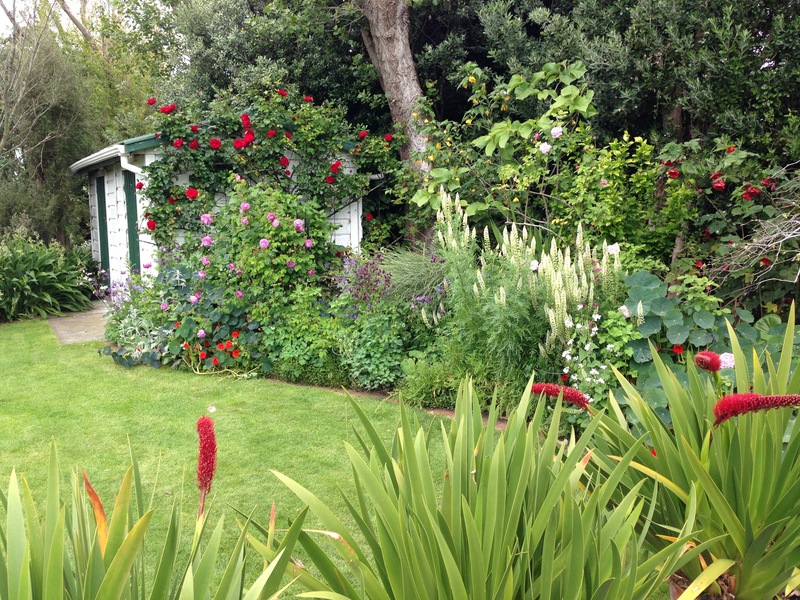 I was still thinking about this garden when I got home and I emailed Jai to find out a bit more. He kindly shared with me his brief, the design plans and more about his philosophy. It was only then that I realised so much of what I have pinpointed over the last six months comes down to Asian philosophy. The yin and yang of complementary, rather than opposing, contrasts. The energy that you feel in some gardens and not others. 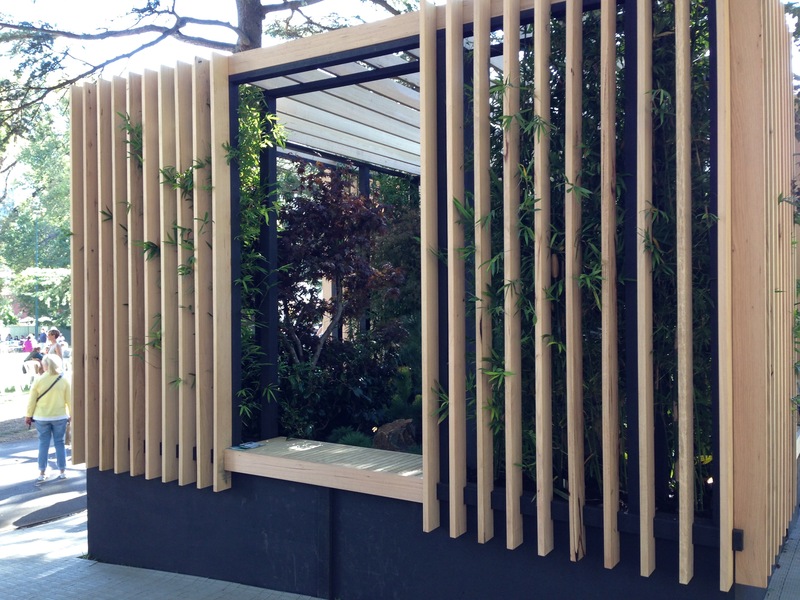 Jai describes the aim of Asian landscape design: ‘to lose yourself amidst the tranquility of the natural surrounds’. This feeling of losing yourself in nature is one that I so often talk about as a key garden success factor. So much more powerful than observing a (albeit beautiful) garden in a detached manner. Jai’s (self-written) brief was to design something to create a sense of ‘feeling at home’. In an age where stress is so prevalent, this balanced, harmonious space is designed to be ‘as intriguing from the outside as it is pleasing to the senses and soothing to the mind on the inside’. Sensory cues are used to bring the attention from the world outside the garden to the world inside the garden and to create a place that is just for you. Ten years ago, I would have liked these words but I suspect I would have found it a little hard to connect with them, to really understand them in a tangible way. Last year, a good friend of mine told me how much she had benefited from an online ‘mindfulness’ programme and, not wholly convinced, I gave it a go. It did indeed help me to stop and put things in perspective, to feel that bit calmer, but the real revelation was that this was the same effect that gardens, gardening and walking in nature had on me. In fact they had a greater effect; maybe because I wasn’t practised in the mindfulness technique but I am always going to prefer to be active, outside in fresh air and surrounded by plants than I am sitting upright, indoors, in a chair, as the mindfulness programme recommended. It’s tricky to discipline yourself to sit upright in a chair and stop for ten or fifteen minutes. It’s much, much easier to discipline myself to go for a walk, pick up a trowel or visit a garden. Now, these words make complete sense to me. They articulate things I have felt but not necessarily quite pinned down in the past. They help to explain why I feel as I do when I experience a really great garden and they help me to create better gardens myself. As Jai describes, as you personally develop, you focus less on visual elements and more on emotion. Quality replaces quantity, acceptance replaces agitation, enjoyment of inner warmth replaces cravings for the external ‘wow’. One begins to ‘feel at home’. Just beautiful words by Jai that I couldn’t agree with more. Yet another view of this diverse, small garden. I will never see space as a restriction again! I hope you have enjoyed Jai’s garden. A garden of unity in diversity and the balancing of opposites. Themes that are meaningful not only in our gardens but in our broader lives. 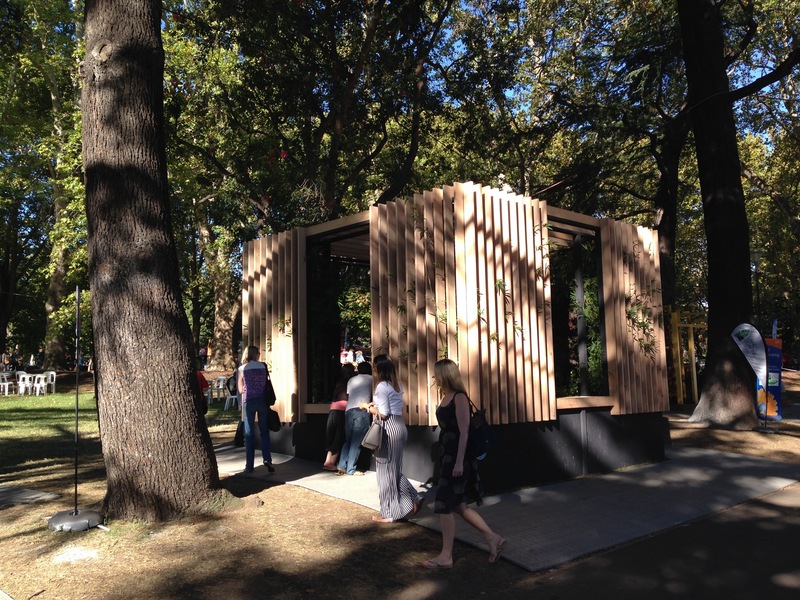 I think I have more reading up to do on Asian philosophy and I am very grateful to Jai for bringing us this very innovative, extremely thoughtful show garden this year. A wonderful mix of old philosophies and new innovation which really make you think. Just the effect I want show gardens to have on me; to inspire me, educate me and prompt new ways of thinking about design. I also urge you, if you haven’t yet found your mindfulness programme, or your walking or gardening equivalent, to keep searching for that thing in your life that makes you instantly unwind. Once you have found it, hold it tight, and bring it into your life on a daily basis. Ten minutes is enough if you can’t spare more. It has been quite life changing for me. 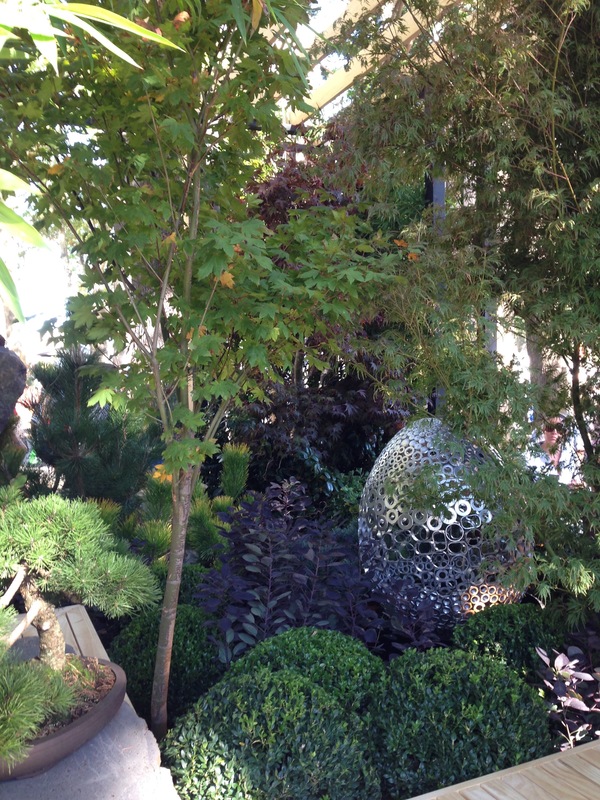 To read more about Jai’s garden and design philosophy, click here to be directed to his website. As a writer, I am always editing and analysing writing (my own and that of others). When I open the pages of a good novel, I know almost instantly if this book will engage me to the end. I don’t analyse the writing (the words used, the grammar) in a good book – I forget all about the writing and allow myself to flow along with the story. I think good garden design is the same – you become lost in the garden rather than analysing its design. 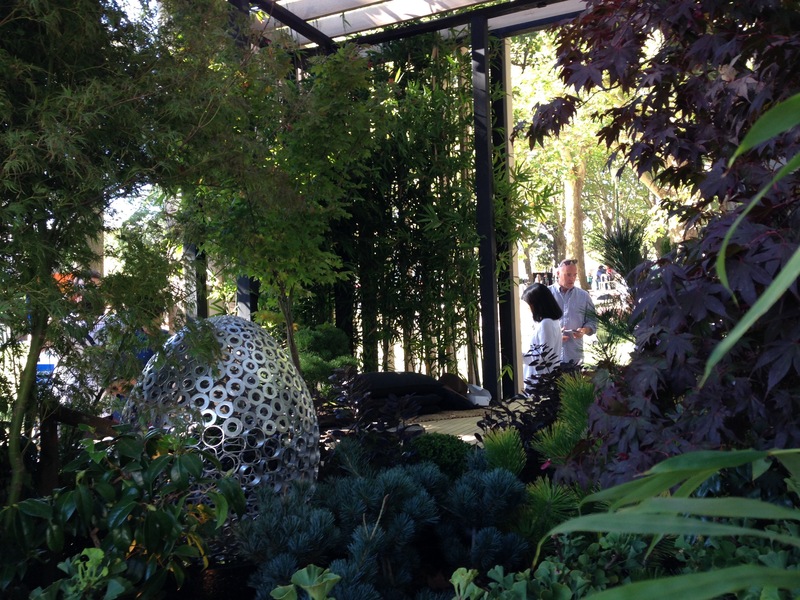 Jai’s show garden seems to have achieved this – such a shame I didn’t see it, sounds like it may have been one that captured my senses too Janna. That’s exactly it, Adriana. I like your terminology. Everything is so much better when we are in ‘flow’. The calming effect of the trees and the different shades of green certainly resonates with me. It’s an interesting concept to view the same space from four sides and it must give a much greater sense of connection than might be achieved from seeing it from a single viewpoint only. A real challenge for the designer though! Exactly right! So much harder to design when it’s got to look good from every angle, but he definitely managed it; no window felt like the back window. If you look closely you will see Jai actually had just three windows in the original concept, but I think four completely transformed it. It feels less staged when viewed from all four sides. Jai is also an architect (of the landscape variety) and so your brains obviously work in similar ways! I’m just a common or garden garden designer so it’s nice to see you agree (I’m also quite pleased to have found a perfectly justifiable reason for using the word ‘garden’ twice in a row!). What an excellent analysis Janna. 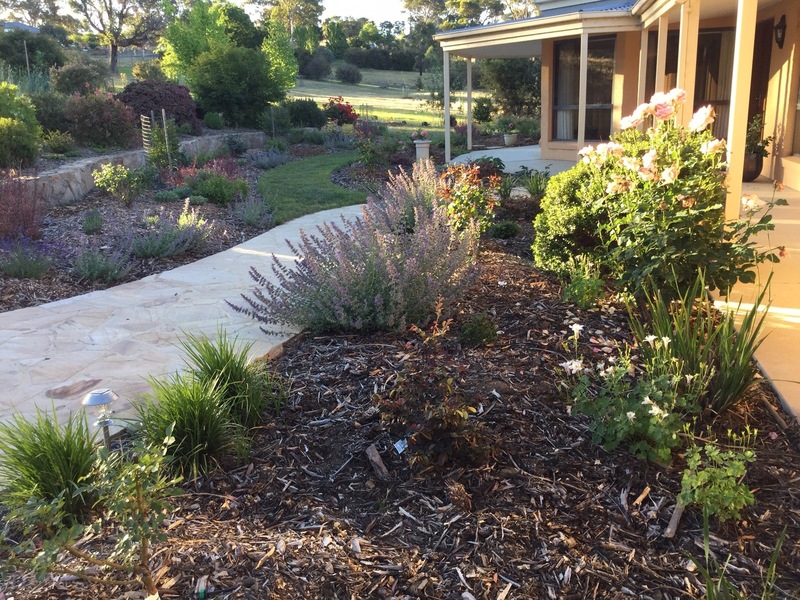 The thing that struck me about Jai’s garden was how, when I looked at it, I didn’t need, or even want, to be in it. My test of a ‘good’ garden is usually whether it has good spaces and shapes for people but with this one, it felt more like a 3-dimensional diorama that I wanted to look at over and over – as you also found. I could see it as a tiny garden outside a window. It also showed the immense power of the constrained vista – the less you could see to start with, the more you wanted to see it all. That’s so true about constrained vistas. 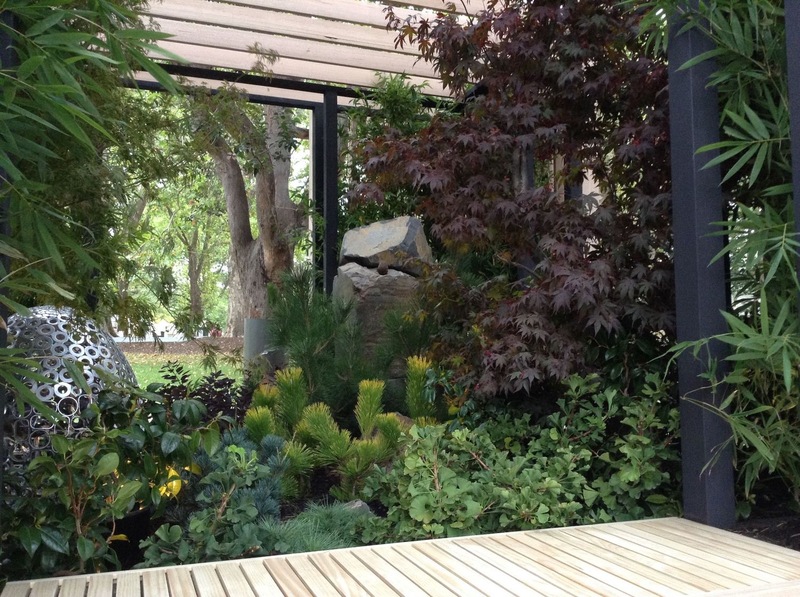 I could see the garden as an atrium within a house….in fact I really rather want one here! Oh this resonated with me Janna, in so many ways! I’ve got some of that inner warmth going, hearing that we are on the same wavelength, Becca! When are we going to start your Fulham Temple, then? Thanks for this great write up Janna. I put together a little booklet outlining the philosophy behind the design. It’s very simple. Love your ibook, Jai; it captures the essence of your design beautifully. Thanks for sharing the link to it. I thought of you a couple of days ago when I visited an outstanding Japanese garden in Vancouver. Will be posting a write up about it soon. If you haven’t been you must put it on your list!